Abandoned Forum • View topic - Do frazzles really deserve an ode? Do frazzles really deserve an ode? A question that has arisen since the radio had an ode to frazzles. Sure they're nice, but I find them too salty -are they really deserving of the time taken to write an ode to them? Would you write an ode to any food? If you have done, share it with us. Re: Do frazzles really deserve an ode? 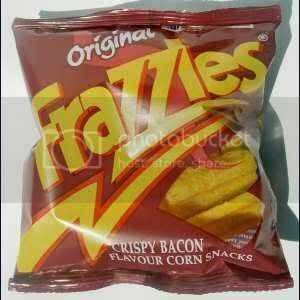 Frazzles are basically a bacon flavour crisp. They have a melt in the mouth texture, and are very strongly flavoured. They are fairly cheap as crisps go. And that was quite something.. I too like m&ms, tub prefer the none peanut ones. I sort to a lesser degree - its a habit I have from other sweets, which I carry out on all elements of food. Green should be eaten first, then yellow, etc. Though some sweet companies have started making yellow a tasty pineapple flavour.. what a dilemma. I wonder how they tested that their earwax flavour really tasted like earwax ...? And why would anyone want to eat a vomit flavoured one?? just the smell makes me feel ill! Sardines, on the other hand - mmm delicious. Sardines....ewww, that is gross. As gross as the rest if you ask me. Although if you got a toddler who picks his nose to eat booger flavor, i'm sure he'd like it. A friend of mine has had a vomit flavoured one btw, apparently they just taste a bit sour - which is a bit of a relief I spose! Yeah, you can't chew without a good gawp.